LASER World of PHOTONICS 2019 trade fair. The INTERNATIONAL LASER MARKETPLACE traditionally accompanies the world leading trade fair LASER World of PHOTONICS. IT is organized by OPTECH CONSULTING and LASER World of PHOTONICS. We thank our media partners for the 14th International Laser Marketplace for their commitment. Update on the Global Market for Lasers and Systems in Materials Processing: Vigorous Growth, Will it Last? Günther Braun served as the Chief Executive Officer and President of Rofin-Sinar Technologies Inc. from May 9, 2005 to July 1, 2015 and as Chief Financial Officer from September 26, 1996 to December 15, 2005. Prior to that he held other management positions with the company. He joined Rofin in 1989 in connection with Rofin‘s acquisition of Coherent General Inc.'s Laser Optronics marking division. He served as a Director of Rofin-Sinar Technologies Inc. from September 1996 to July 1, 2015 and was from 2007 to June 2015 Chairman of the Working Committee Laser and Laser Systems for Materials Processing within the VDMA (German Machine Tool Association). Mr. Braun holds a Master Business Administration Degree from the University of Applied Science Regensburg, Germany. Günther Braun presently works as independent consultant. At the 14th International Laser Marketplace he moderates the CEO interviews and the executive panel discussion. Mr. Merk was appointed Executive Vice President and General Manager, Industrial Lasers & Systems at Coherent in December 2016. Prior to that, Mr. Merk was Chief Executive Officer and President of Rofin‑Sinar Technologies Inc. and a member of its board of directors from July 2015 to November 2016, when the acquisition of Rofin by Coherent was completed. From December 2005 to July 2015 Mr. Merk was the Chief Operating Officer of the Rofin Micro and Marking Business and a Managing Director of Carl Baasel Lasertechnik GmbH & Co. KG from May 2000 to November 2016. He started his career in 1989 at Boehringer Werkzeugmaschinen Vertriebs GmbH, a machine tool company, and remained there until 2000, most recently serving as managing director. Mr. Merk holds a Master’s Degree in mechanical engineering from the Technical University of Stuttgart, Germany. Prof. Falk Strascheg, partner of EXTOREL, is one of the most experienced and successful venture investors in Germany and Europe. He built his own laser technology company with Laser-Optronic in the 1970s and 1980s and successfully sold it to Coherent Inc., Palo Alto, California. In 1987, he co-founded TECHNOLOGIEHOLDING, one of Europe's leading venture capital firms, which was acquired from the British 3i Group plc. in the year 2000. 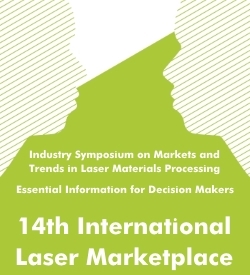 At the 14th International Laser Marketplace Falk Strascheg discusses with Günther Braun. At the 14th International Laser Marketplace Quitao Lue gives a presentation on the laser market in China and joins the panel discussion. Berthold Schmidt is CTO of the business unit Trumpf Laser Technology, Germany. Earlier he was CEO of TRUMPF Photonics Inc., the production center for III-V high power diode lasers and subsystems located near Princeton, NJ. Previously, he was Head of Corporate Research establishing the TRUMPF Venture GmbH to promote disruptive technologies in early startup companies. Before joining TRUMPF, he was CEO of Intense Ltd. in Scotland, UK and active in various management roles at Bookham, Switzerland. Berthold Schmidt received his PhD from the Technical University in Munich. He graduated from the University in Wuerzburg, Germany, holds a MSc from SUNY Albany and an executive BBA from the GSBA in Zurich. From 2005 to 2018 Berthold Schmidt supported the Swiss Commission for Technology and Innovation (CTI) in the field of micro and nano technologies as a technical expert. Koji Yasui received B.S. and Ph. D. degrees from the University of Tokyo in 1982 and 1989 respectively. He was a visiting scientist at the Stanford University in 1989. He joined Mitsubishi Electric Corporation in 1982, where he has developed high-power CO2 lasers, high-power solid-state lasers, high-power green lasers, high-power 266nm UV lasers and laser processing machines using those laser sources. He is now working as a senior chief engineer and as a senior chief technologist in charge of laser technology, EDM technology, CNC technology and e-beam technology and related businesses. He is also sub-program director of SIP and program sub-leader of COI, programs supported by the Japanese government. He is a committee member of various IoT/AI related meetings. Prof. Halefsan Sumen earned his Electrical Engineer degree from Technical University of Istanbul, and his Ph.D. in Engineering Management from Marmara University of Istanbul. He has a dual career both in university and private sector. For seven years he lectures several courses under the supply chain management topic in Maltepe University of Istanbul and works more than 10 years as editor-in-chief and columnist in monthly Turkish magazines: Industry 4.0, Robot Investments, and Automation, published by ST Endustri Medya. At the 14th International Laser Marketplace Halefsan Sumen gives a presentation on the laser market in Turkey. Dr. Martynas Barkauskas is recently appointed CEO of Light Conversion, a leading femtosecond laser manufacturer located in Vilnius, Lithuania. Femtosecond lasers from Light Conversion are broadly used for scientific and industrial applications with more than 10 years history of their usage in 24/7 manufacturing. Previously, Martynas held different positions within the company working at femtosecond laser development, managing world-wide service actives, and serving as head of sales. He holds a degree in laser physics from Vrije Universiteit Amsterdam, the Netherlands, and PhD in ultrafast spectroscopy from Vilnius University, Lithuania. At the 14th International Laser Marketplace Dr. Martynas Barkauskas joins the panel discussion. During the registration process, after entering your name and company data, you can choose to purchase visitor tickets for the LASER World of PHOTONICS trade fair and / or for the 14th International Laser Marketplace. Optech Consulting organizes the 14th International Laser Marketplace in co-operation with the LASER World of PHOTONICS trade fair. For any questions and registration problems please send us an email.